This renovated, traditional country house with the view of the forest is nestled in an olive grove. 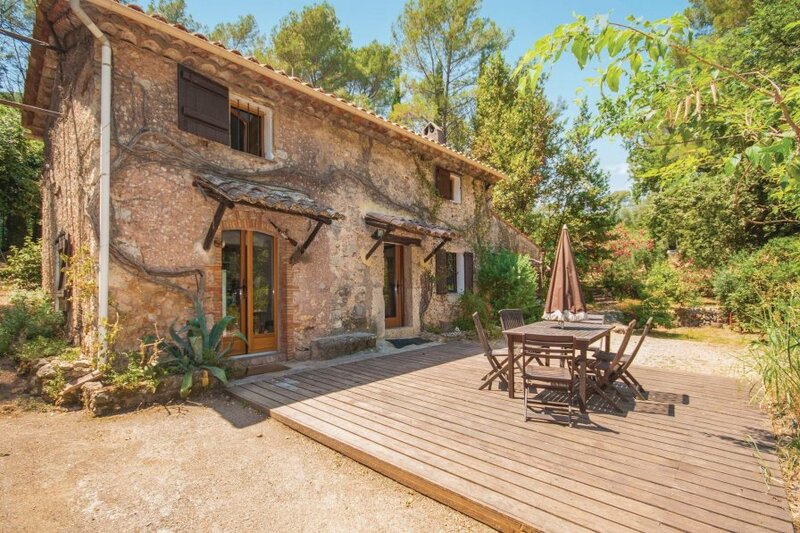 The terraced property is a haven of tranquillity and is close to the centre of Grasse. This old mas is a chaminrg holiday property situated in the heart of an olive grove, on a huge sloping hill, a peaceful haven overlooking the forest, wilderness, while being located 10 minutes from the main roads of Grasse. The mas offers a sober and simple decoration with traditional whitewashed walls. A kitchen with modern conveniences, overlooks the natural garden; the dining room is not adjacent to a closed living space and can provide an additional sleeping with an extra bed for one person. Ideally located for exploring the area, just minutes from the center of Grasse perfume town, the fast lane will lead you to the coast and its beaches. Cannes is 20 minutes away and Antibes is 25mn away. This villa is made from brick or stone and was originally built in 1866 and refurbished in 2011. The agent has rated it as a two star property so it is a plainly furnished villa with limited facilities. It is ideal for a cheap holiday. The villaIt is located in Saint-Jacques Sud, 20km from Cannes. It is set in a good location: there is a restaurant 1km away.